This is Jazz. One of our original Petit Paradis guinea pigs, sunning herself happily in our garden. People are often surprised and curious that we have guinea pigs running free in our edible garden so I thought I should do a post about it. I’ve kept guinea pigs free in the yard for over 5 years now and it now strikes me as odd to keep them in cages. I originally began to keep free-range guinea pigs over ten years ago when I had a small group that I kept in a large chicken cage. Central to the garden was a wooden slat shade house and I had some GP’s get out and set up house in there. I soon realised that this was an ideal home for them because they could shelter in the shade house and come out through the slats to feed on the slopes of buffalo lawn that I had growing, as well as other bits and pieces close to the shade house. Stray dogs, cats and hawks were frequent ‘visitors’ to the garden and at the slightest presence of these the GP’s would run quickly to the shelter of the shade house and through the slats to the inside. A couple of things happened almost straight away. I realised that they would be able to forage their own food this way and that I could still supplement with scraps I bought home from working at a cafe. Their health also improved considerably or should I say their level of fitness, and then their health. The level of care required dropped quickly as there was plenty of feed from the lawn and garden and only the odd sweeping out of the shade house to collect droppings for the garden. The rest of the guinea pigs were released. A notable observation was the fact that the GP’s seldom ventured any further than a few metres radius of the shade house – with one exception being a younger one that took to fancying the neighbours lawn better than my own and would venture through the wire fence and feed there, much to the delight and amusement of the neighbours. I have noticed this with our current GP’s also. We originally received two females and housed them in a hutch on our deck. It wasn’t long before they too were released into the garden, but with different intentions as I will mention later. I gave them the same necessities as the previous family I had kept. They had a ‘base’ that they could run to and shelter in, quite central to the garden and other little spots were set up around the garden such as half concrete slabs leaning against pots or propped up with bricks. Many of these were camouflaged within the garden themselves making a convenient escape from stray cats and hawks passing over-head. We were not altogether aware of the impact that this would have on our new pair of female guinea pigs. Both Maiki and Jazz looked like they were much older females when we received them from their previous owners. After a short while it was clear that they had a bad case of mange. We tried various treatments and got it under control. It was then that we released them into the garden. And they changed. They started to look younger and more youthful. Their over-grown claws which we had to trim regularly began to take care of themselves with all the work of running and moving about on limestone rubble and earth. They ate a wider variety of foods and their coats started to shine and look younger and finer. They began moving quicker and faster and were more alert and appeared to be more appreciative when we caught them to give them the odd combing and cuddle. Initially it was a small challenge to keep green feed readily available in the quantity that they were consuming. It didn’t take too long and I now have a small forest of sugar cane as a stand-by. In the meantime they set to work which is the intention I had for them from the beginning. As the garden grew and I had ‘green waste’ to deal with this became a staple for the GP’s. We still supplemented with pellets and the odd amount of straw and have since cut this down to pellets only. The rest of their diet they get from the garden and our kitchen scraps. The majority of it being sourced by themselves directly from the garden. 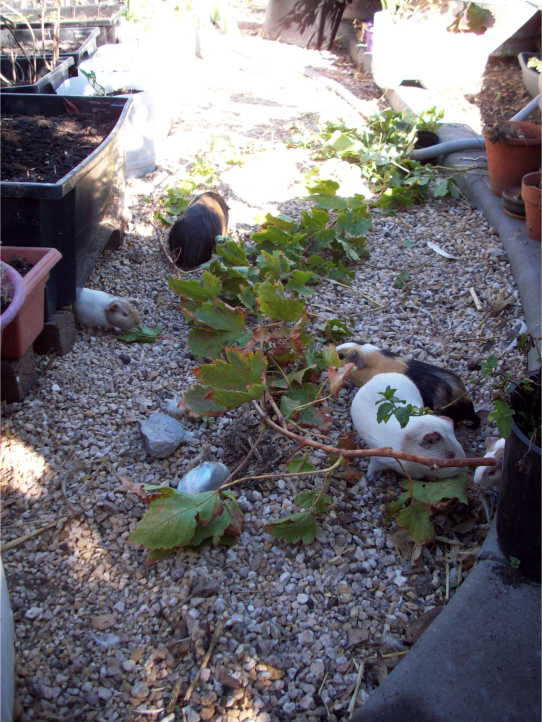 In the picture above you can see a gathering of females feeding on grape-vine cuttings. When I prune areas of the garden I generally lay the cuttings out on the ground for the GP’s to feast on. Any left overs are either composted or added to the chook pen. Since our initial family of GP’s I have tried to keep only females. Late last year we brought in a new couple and one soon proved to be a male. As it turned out we lost him during a particularly hot day this summer – he was the only guinea pig in a hutch as we were keeping him segregated from the females. During hot days such as we experience in summer we have noticed that the GP’s take shelter either under our house or in areas of the garden where they can find a shady, cool spot. Our little male did not have this luxury. Previous times in summer it would be a trip home by my wife to make sure the GP’s had an ice block and plenty of water in their hutch. Another advantage of having free-range guinea pigs. They will find places during summer and winter that are adequate shelters. They are smart animals I think and perfectly capable of managing themselves.